Today we went to Gimme! 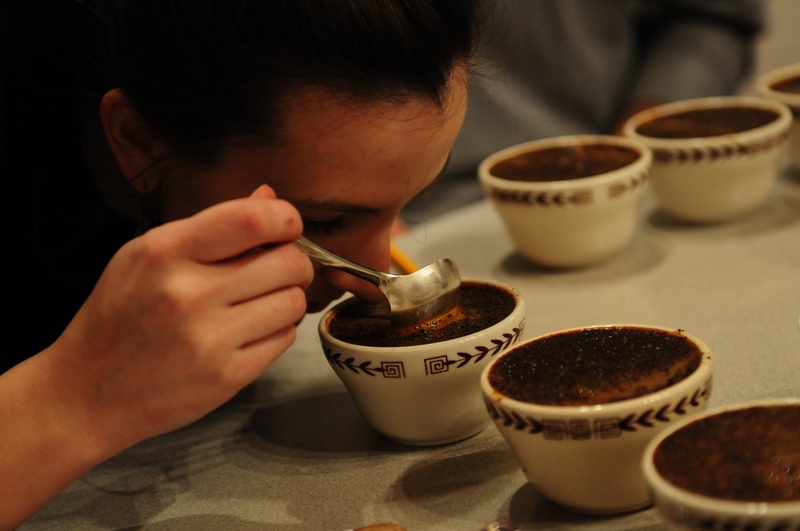 Coffee’s weekly ‘cupping’ at their State St. location in downtown Ithaca. We got to try four coffee varietals: Kenya Kiandu, Guatemala Atilán, Honduras Linda Vista, and Honduras Las Penitas. After we had a quick lesson about the coffee production process, we got down to ‘cupping.’ ‘Cupping’ is the method of determining the quality of coffee beans by coffee professionals. 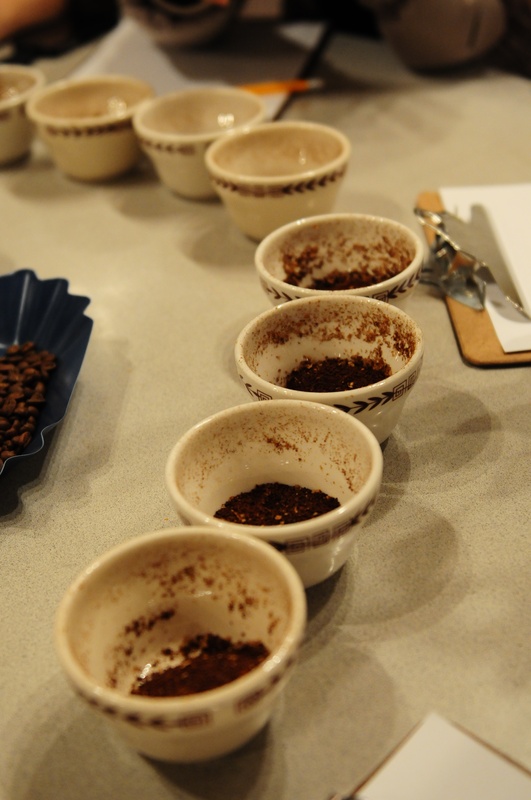 Small portions of different varietals are ground, smelled, and tasted to compare aromas, flavors, and quality. Coffee beans are very labor-intensive; they need to be picked manually at the height of ripeness. Machines cannot do this since the coffee berries on the same tree are at different stages of ripeness. The coffee bean itself is the seed of the fruit. The fruit is taken off through drying or washing. The four varietals were ground up for us to smell. The aroma is not necessarily indicative of the coffee’s final taste, but it’s interesting to compare. The Kenya Kiandu has recently been rated an incredible 95 by Coffee Review. We thought the Kiandu smelled salty, almost like soy sauce. The two Honduran ones were more mild and what we thought coffee usually smells like. The Guatemala’s aroma was rich and hazelnut-y. After this step, we added hot water to the cups of ground beans and waited four minutes exactly for the flavors to be extracted. 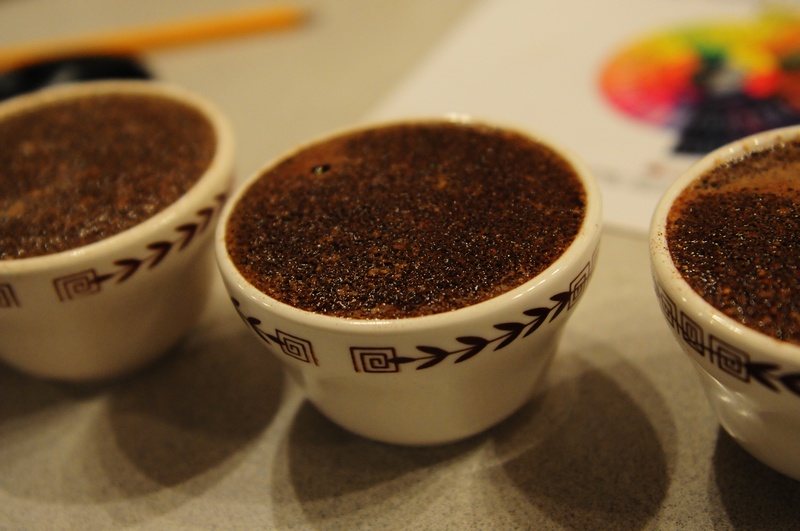 During the waiting time, the coffee grounds rise to the top of the cup and form a crust. After four minutes of waiting, we lightly scraped off the crust. 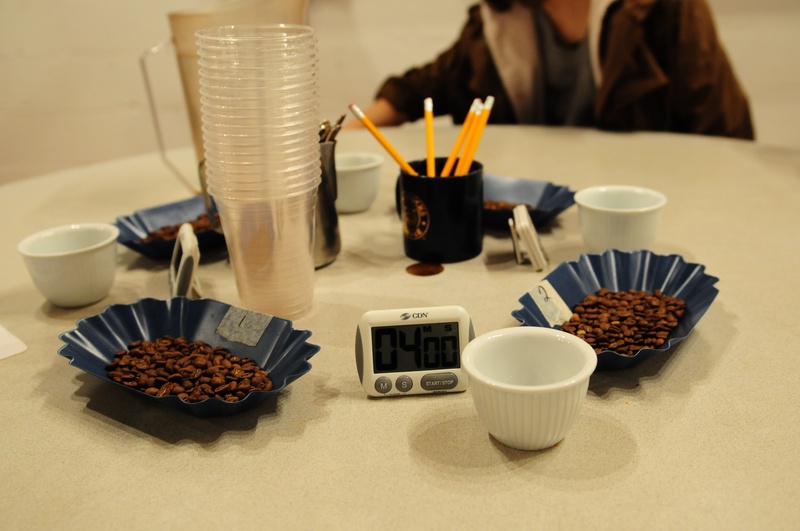 More intense aromas burst from the brewed coffee as we put our noses right into the cups. 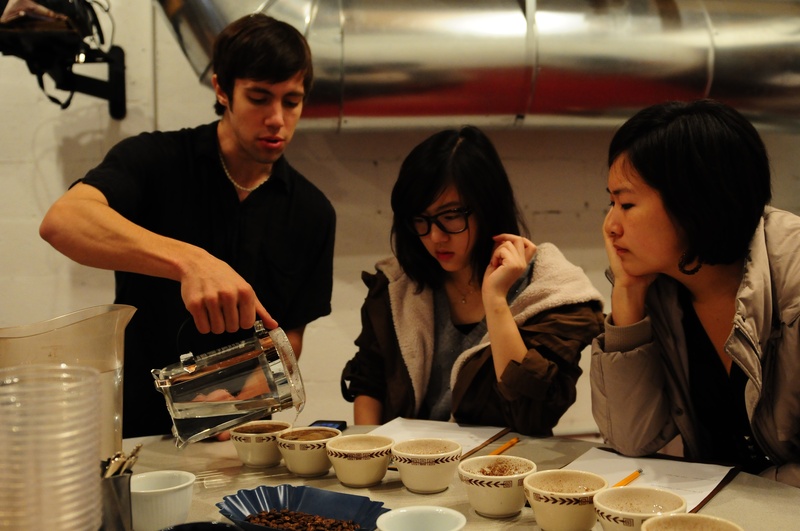 After smelling, we drank the coffees; the best way to get the full flavors of the coffee is to slurp! The more oxygen you mix with the coffee, the more flavor you get. The biggest surprise was the Kenya Kiandu. It was very different from most coffees we were used to. The Kiandu had the acidity of tomatoes and was strangely vegetable-y. 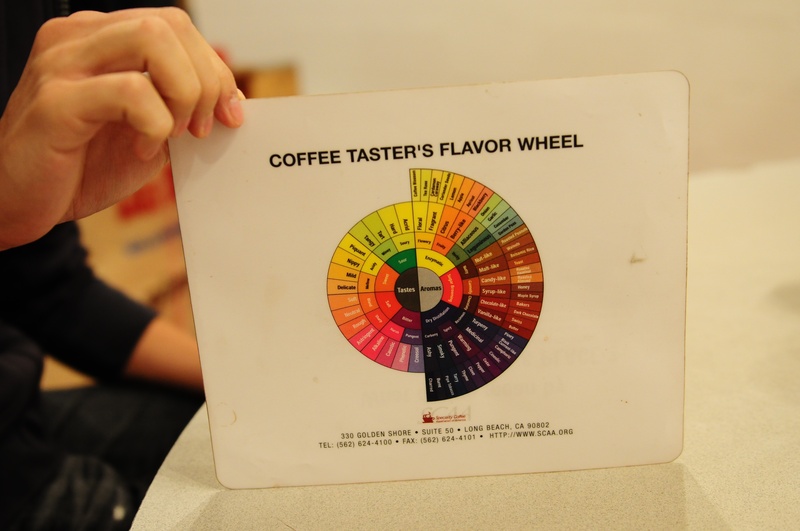 The Honduran coffees, the more popularly consumed coffees, tasted nutty and toasty, similar to what we find in most coffee shops. Gimme! 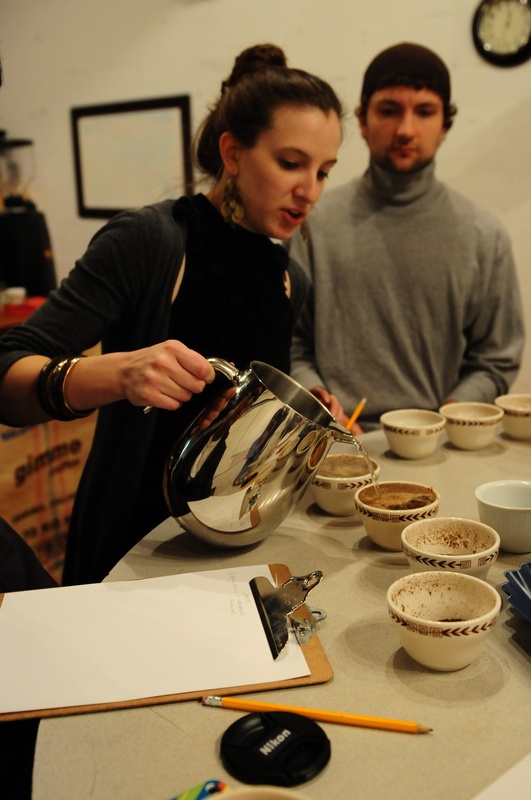 Coffee has cuppings at their State St. shop at noon every Saturday. Their staff is very friendly and knowledgeable. It’s a great way to start your Saturday and get free coffee!